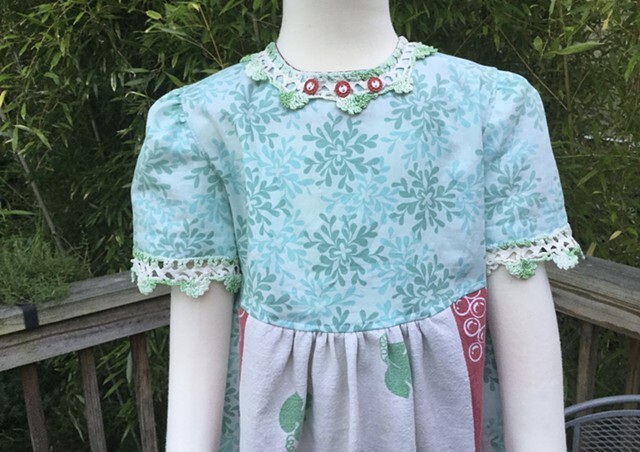 “Bowl of Fruit” image on vintage dishtowel becomes the skirt of a special dress for a 5-6 year old (K-1st Grade), complimented with high-quality smooth cotton print in sea-foam green. Curved waist offers ample space of 24” across, measures 20” from shoulder to hem. Closes down the back, including placket on the skirt with super-sweet red and white antique buttons, crochet adorns the neckline and sleeves. $100, 100% cotton, made by the designer herself and shipped free to any address in the U.S.